When your workstation calls for a keyboard tray that houses all of your accessories on one handy surface, design the perfect one for you with the Humanscale 500 Big Keyboard Tray. Humanscale keyboard trays are designed to ensure that nearly all users are able to work consistently within their Neutral Reach Zone, keeping them in a comfortable posture. A major way to avoid stress injuries is to task on a keyboard tray that allows for negative tilt keying, typically between 0 and -15°. This assists your wrists while you type and mouse, supporting them and leading you to a more comfortable working experience. Keep your keyboard, mouse, and everything you need at your fingertips with one desk accessory. The Humanscale 500 Big Keyboard Tray is available in a Design Your Own option, letting you pick the components that aid you in working better. The Humanscale 500 Big Keyboard Tray is available in black, white, or platinum. Both the keyboard mechanism and platform will come in the chosen color. For the 500 Big Board, you can select a solid 27" palm rest or a split palm rest with one 20" section and one 7" long section; this feature comes in handy if a user doesn't want a palm rest in front of their mouse or keypad (pictured in main image above). All are covered with an easy to clean, black synthetic leather. For users with "slim" keyboards such as those made by Apple, a 19'' "slim" gel palm rest is available. Please note that this palm rest will not reach across the entire length of the tray, and will not fit flush against the keyboard tray corners like the 20'', 25'', and 27'' palm rests. The slim 19'' palm rests will sit roughly 5/8'' away from the closest corner when installed. When designing your Humanscale 500 Big Keyboard Tray, if you choose to not add a palm support, there will be holes located at the installation points on the tray. The 500 is the perfect platform for a larger keyboard or a keybord with the mouse next to it or those who may use a secondary keyboard in addition to the main keyboard. 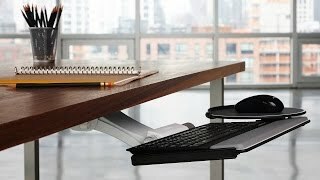 I purchased this keyboard tray due to an ergonomic evaluation indicating need to have lowered usage without a hand reaching for the mouse. So far so good. The only wish I have is that it had the capacity to go UP as well as down...so I could stand and type. Also, while customer service was helpful...I do not think they were as thorough as they should have been when dealing with someone who really didn't understand the measurements etc.... But it could have been just the one person on the phone that day because my other call with them was super! I purchased this keyboard tray due to a 2 month pain in my elbow. After using the product for one week my elbow pain started diminishing and after three weeks was gone completely due to the ergonomics of the keyboard tray. The tray was easily installed and setup/adjusted. It is adjustable so anyone that uses my desk can adjust to the correct height. Very will made with little to no shaking motion while typing. We have purchased several of these for our company. They are well built with great ergonomics. We will be ordering more! I had pulled out an old tray from the trash several years ago, but it finally gave out and would just sink onto my legs. I ordered this one and it is better than I could have dreamed. I use a Kinesis Freestyle keyboard tilted and spread pretty far apart with the numeric keypad off on the right edge and the Orthomouse (more like a rat than a mouse) in between them. It all actually fits. I didn't realize that I could put a tilt on the keyboard tray that allows me to type without bending my wrists at all. It is great! I LOVE it!!! I ordered this tray to replace the standard non-adjustable tray that came with the home office desk. Installation was straight forward, and the tray is easy to use ? I highly recommend it. This is the second keyboard tray I have purchased from your company and have been very satisfied with both. They meet the needs of my home office environment exceptionally well. From product selection through installation and usage every step was made as simple as possible. I have already recommended your website and products to several of my friends and coworkers. Thanks for making my web experience a positive one.